During our 2012 trip to India, we made a short detour from visiting friends in the south, to explore the wonders of Agra and Jaipur. And no trip to India is complete without seeing one of the Seven Wonders of the World, the Taj Mahal. The 17th century mausoleum has an impressive collection of Persian, Islamic and Indian design elements. We arrived a half hour before sunrise, and had the unique opportunity of wandering around the grounds with few people around. With so many designs, from grand to small in scale, it is difficult to distill ideas into a workable piece. Based upon the number of photos in my design folder, I expect there will be many more pens inspired by this location. The pattern used here is taken from a marble tracery around the base of a column. It is rendered here in Argentium silver with niello inlay. The spring loaded clip features a small niello flower. 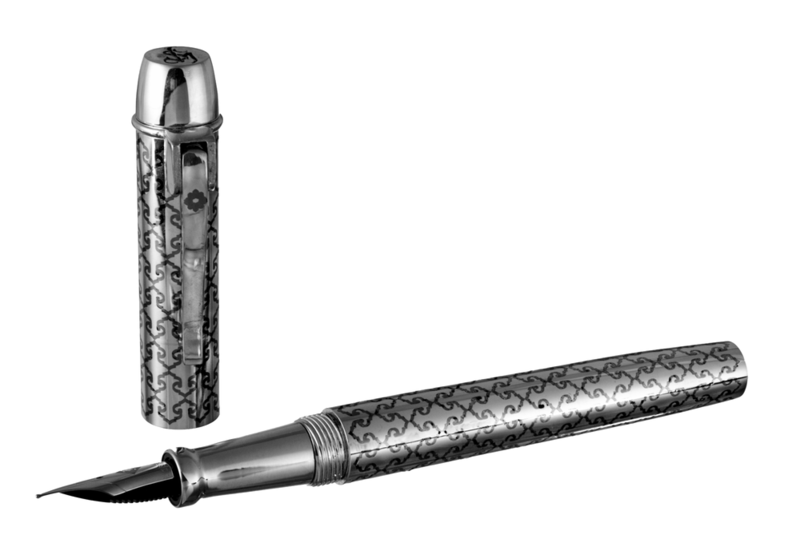 The rhodium plated, 18k gold nib is available in extra fine, fine, medium and broad. There are 10 available in Argentium silver, and one in 18k gold. Each pen is individually made once an order has been placed. Please allow 4-6 weeks for completion.